Hello to you all. After a couple of months of good distribution (by time) the magazine did not arrive again. As a subscriber it is kind of frustrating. Last year it was also a couple of months terrible. The last magazine I received was half way december. Seems that the distribution company of the mag is doing a terrible job. At least by distributing it to my address in the Netherlands. Strange thing is: the mag is alway in store here by time (?!). The last 2 years the delivery is terible. My menbership of the mag is now 10 years and I still have the same delivery-address. Strange. Strange. Strange. HA HA like anyone at the mag even reads this forum. I'm having the same problem Peter - haven't received a mag in months. I've emailed Miranda numerous times...doesn't seem to work. I know: it is terrible. Promises are never keeped. They do not deliver. Shame. Been a subscriber for years. Sorry to hear that Peter but unless Miranda herself appears on here we don't have a better way of contacting than you. problems here too. it's end of February and, I just received... December issue!! this is unbelievable. I am a subscriber for few years now and desipte living in UK this isn't first time this is happening. 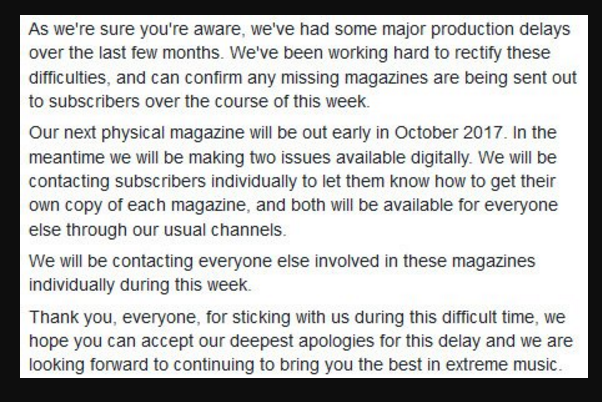 I emailed Miranda@DarkArtsLtd.com each time magazine was delayed and I never got any reply, not even a simple apology, I can't believe this. I subscribe to other magazines - Decibel, zero tolerance and metal hammer - never any problems there, only terrorizer is notoriously late. I'm losing my patience, what's the point of subscribing if I'm getting the magazine with 2 month's delay?! Well here I am again with the same complaints. The magazine is always very late or does not arrive at all. It's going on since Louise Brown left (and formed the Iron Fist Mag - maybe we should all go there Terrorizer Mag treats their subscribers terrible. It is goin on for 2 years now. Every moth I have to e-mail Miranda..
Maybe everyone who has the same problems can contribute to this message-board to send an alert so that a shitstorm will arrive in their office and something will happen. it's the end of July, issue 282 has been long in stores - I neither have 280 nor 281... I tried emailing miranda@darkartsltd.com and subs@darkartsltd.com - no reply at all. Tried calling +44 (0) 20 7729 7666 - no one is answering the phone. This is absolutely ridiculous. Is Terrorizer Magazine finished? Anybody alive there???????? As a subscriber I have not seen the mag in months. What's up? No answers. No news. Anybody alvive there????????????????????????????????????????????????????????!!!!!!!!!!!!!!!!!!!!!!!!!!!!!!!!!!!!!!!!!!!!!!!!!!!!!!!!!!!!!!!!!!!!!!!!!!!!!!!!!!!!!!!!!!!!!!!!!!!!!!!!!!!!!!!!!!!!!!!!!!!!!!!!!!!!!!!!!!!!!!!!!!!!!!!!!!!!!!!!!!!!!!!!!!!!!!!!!!!!!!!!!!!!!!!!!!!!!!!!!!!!!!!!!!!!!!!!!!!!!!!!!!!!!!!!!!!!!!!!!!!!!!!!!!!!!!!!!!!!!!!!!!!!!!!!!!!!!!!!!!!!!!!!!!!!!!!!!!!!!!!!!!!!!!!!!!!!!!!!!!!!!!!!!!!!!!!!!! This just popped up on Twitter. Thanks to all our readers who have stuck with us - we should be on top of delays and back on track for next month. No mag since November's issue, no social media presence since 15th November (Facebook) or 18th December (Twitter), no emails from the team. So... are we officially dead now? My sub renewal comes up at the end of the month and I think I'm going to have to cancel. Been a buyer since issue 1 and a subscriber since issue 80-odd. Sad times.